NOTE.—This Society is not responsible, as a body, for the facts and opinions advanced in any of its publications. 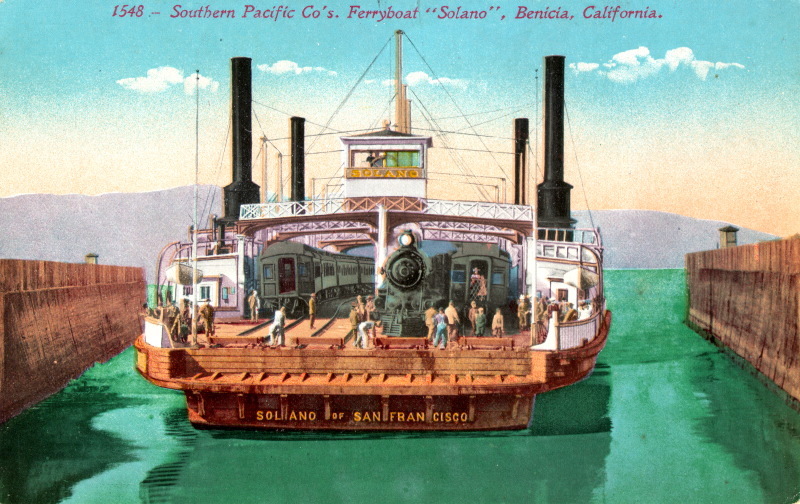 THE RAILROAD FERRY STEAMER "SOLANO." By ROBERT L. HARRIS, M. Am. Soc. C. E.
During a journey in 1885 to and from my old home in California, I saw much to interest me socially and professionally. 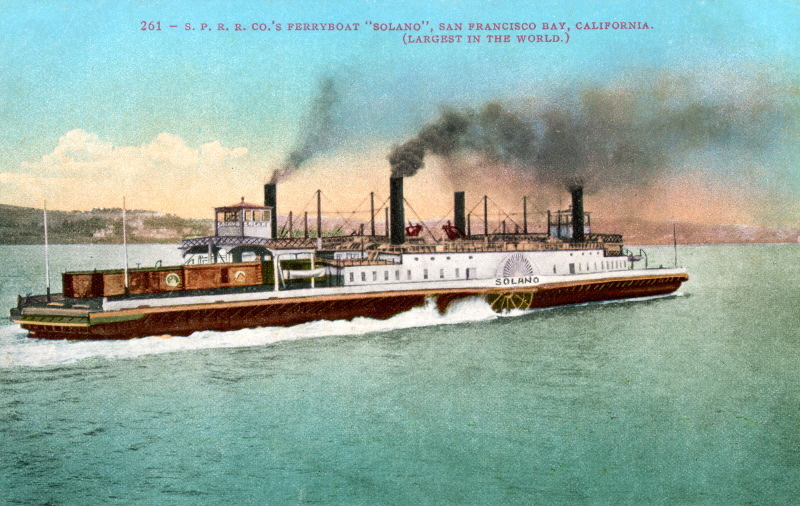 Among the objects of engineering development was the Railroad Ferry Steamer "Solano," which is supposed to be the largest in the world and which belongs to the Central Pacific Railway Company, and is in use at the Straits of Carquinez. Perhaps this subject has peculiar interest to me, in that memory reverts to the "fifties," when the great boat "Maryland" ferried the Philadelphia, Wilmington and Baltimore Railroad passengers across the Susquehanna River at Havre de Grace. This boat now runs on the East River in connection with the New York and New England Railroad and the Pennsylvania Railroad. The capacity of its two tracks is fourteen freight cars, which may be borne in mind as a familiar standard for comparison. CPRR Ferry Solano. 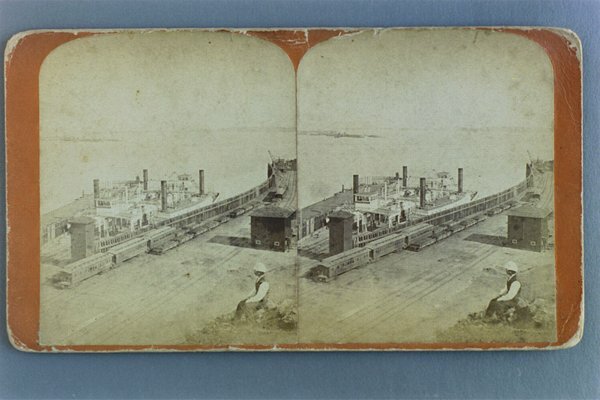 Watkins Stereoview #3797. Memory has thus brought me forward to the "sixties," when a "grand" ferry-boat, the "Louise," with its new contrivance of compound engines (and more levers than a man could jump to), was built to run between San Francisco and the modest little "San Franscisco and Oakland Railroad," 4 miles in length, for which I obtained the first financial backing and was engineer, and which we then truly prophesied would grow to be the terminus of the great Transcontinental Railway, before such a thing existed except in the minds of enterprising, dauntless men. 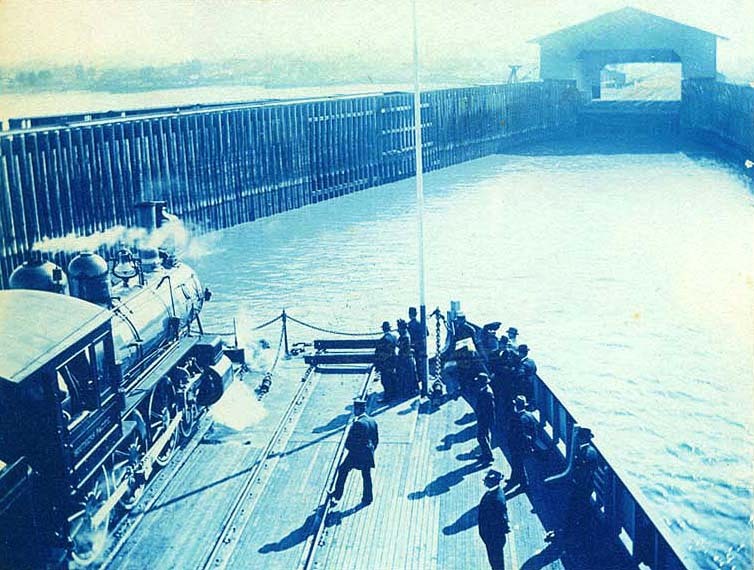 Still later, memory brings me to the "seventies," when as Chief Engineer of the Chicago and Canada Southern Railway, a trial trip was made on the Detroit River with the large railroad ferry-boat the "Transfer," with three tracks to convey at once twenty-one freight cars between Amherstburg in Her Majesty's Dominion and Grosse Isle in the United States. Let me say, in passing, that this is Grosse Isle (French), not "Goose Ile," as its first post-marking stamps actually came from the Washington General Post Office in 1872. Drag on the image below to view 360"(dm; interactive "QTVR" panorama of the Straits of Carquinez. The QTVR ("QuickTime Virtual Reality") 360"(dm; interactive panorama above, which shows the remains of the SP Ferry Slip at Benicia, CA, was created by photographer and digital artist Bruce C. Cooper who composited some 20 digital images he took there on August 13, 2006. To see the full panorama, click and hold on the image and then move your cursor right or left to rotate the view. (Requires QuickTime plugin.) The location of this Straits of Carquinez panorama is shown on the map and aerial view below. The paddle wheels (feathering) are 24 1/2 feet diameter. Each wheel has twelve floats which are 9 1/2 feet long and 40 inches wide. The motive power is one surface-condensing beam engine with cylinder 54 inches in diameter and stroke of piston of 11 feet. 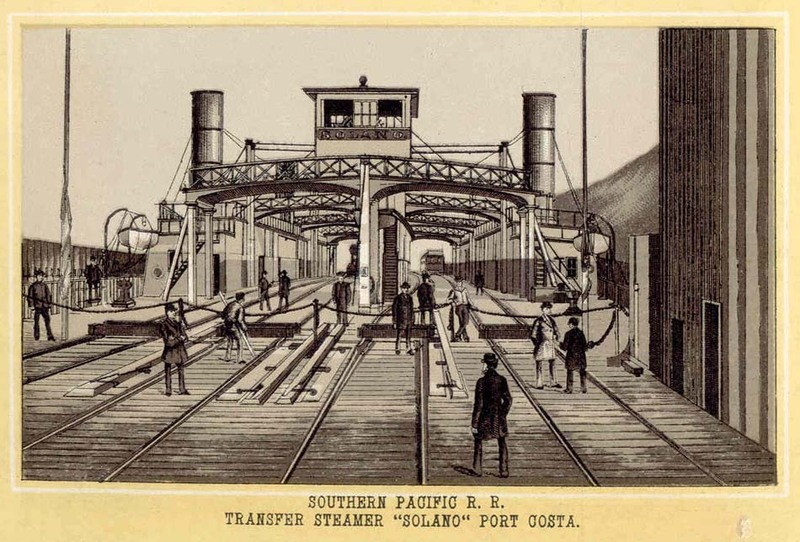 DESCRIPTION OF THE CAR FERRY STEAMER "SOLANO" AND THE SLIP AT PORT COSTA, NORTHERN RAILWAY, CALIFORNIA. By Arthur Brown, Superintendent Bridges and Buildings Department, Central Pacific Railroad. Propelled by two vertical beam engines, placed on the center of boat, 8 feet fore and aft of midships, making the distance from center to center of shafts 16 feet. Each engine drives one wheel, and works independently of the other. The boilers are of steel. They are placed in pairs on the guards fore and aft of the paddle wheels, and are so connected with the engines that one or all may be used at pleasure. The boat is stiffened longitudinally by four wooden Pratt trusses (vertical posts and diagonal rods), one under the center of each track. [Shown in cross—section as between each track at midships; better shown in plan.] The members of these trusses are proportioned to stand the heaviest loads which can come upon them. In calculating the strains, the difference between the sum of the weights at each panel, and the displacement for the panel length was assumed as the maximum force acting at that panel. For several panels at the center and ends of the boat the, weights exceed the displacements, but, between, the reverse is the case. A separate calculation for displacements, etc., was made for each position of the moving loads. Success in handling a boat of such dimensions in an 8-mile current is due principally to the use of balanced rudders in connection with hydraulic steering apparatus, and to independent engines. There are four balanced rudders coupled together at each end of the boat; at the forward end they are held in position by the pin, which is removed at the stern. The axis of the slip on each side of the straits coincides nearly with the direction of the current, pointing on the Port Costa side up, and on the Benicia side down stream, so as to facilitate entering the slips. The distance across is one mile; the whole time consumed in transit is nine minutes, including starting and stopping. 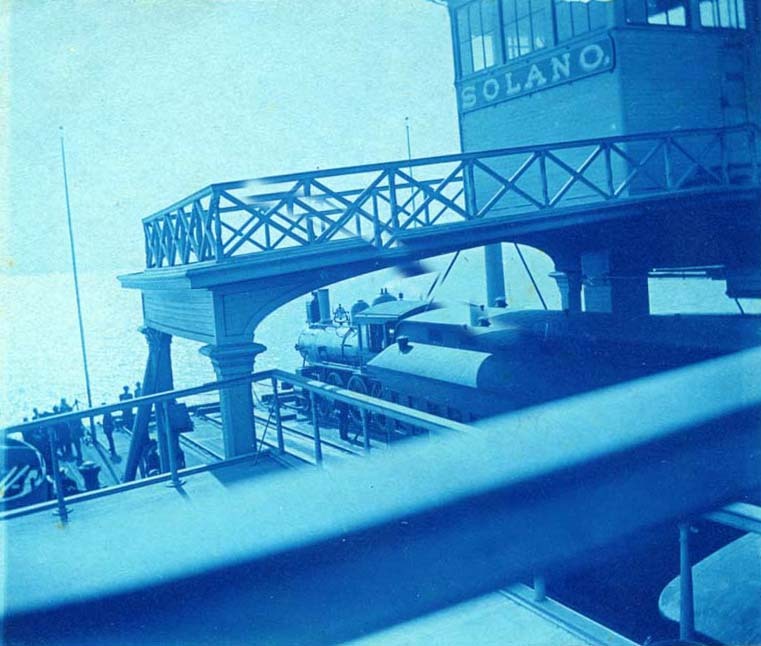 "Portion of the ferry, a train that is making the crossing, and the name of the ferry 'Solano' on the side of the upper tower." "Front of the ferry, carrying a train as it comes into the landing area." Solano San Francisco Bay CPRR Ferry. Photographer unknown. Cyanotype Images & Captions Courtesy Fred Sherfy. The "Solano" has been running four years without trouble, and is handled with great ease. The variation of tide rendered necessary the use of a hinged apron, A (see Plates LIX and LXI), supported in part by a wholly submerged pontoon, B, and in part by the counterpoises C. The apron is 100 feet long by 44 1/2 feet wide, and carries four tracks, corresponding with those on the boat. Its weight is about 154 tons. The pontoon displaces about 65 tons, and the counterpoises about 12 1/2 tons each, the remainder being carried by the hinge H. When in use the apron rests upon the end of the boat in a recess into which it fits with a little play, so that the wharf and boat act as abutments for the moving load. 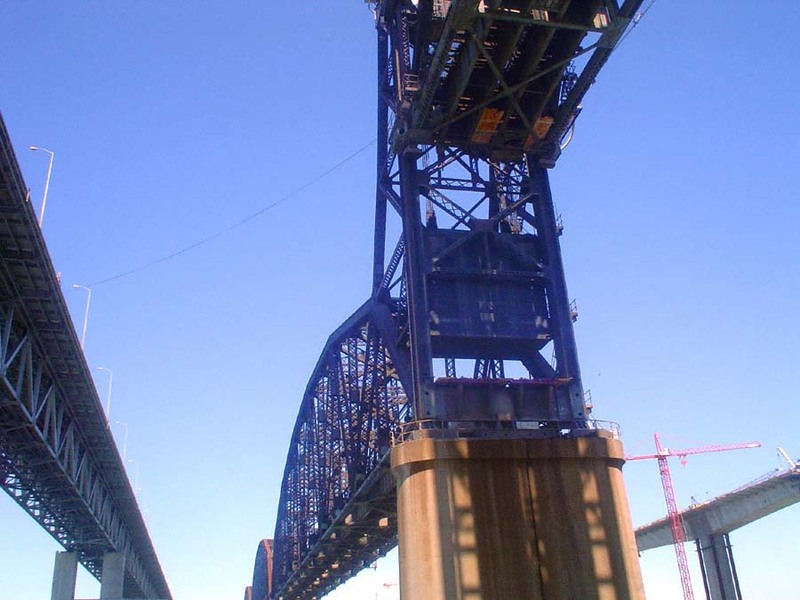 The apron is composed of five longitudinal bow-string combination wood and iron trusses, from which are hung floor beams carrying the track stringers. When the boat has entered the slip and is in position to receive or discharge a train, the counterpoises are raised by hydraulic power; leaving 25 tons of the apron unbalanced, this sinks the pontoon, and when the end of the apron reaches its place on the boat it is securely latched down; the counterpoises are then released ; the apron and boat are now free to rise and fall with the tide, and the apron is ready to rise from its seat as soon as unlatched from the boat. The boat is held up to the apron by means of two mooring rods, which run the entire length of the apron, are hinged at H, and bolted back, as shown, to the piling. The rods are connected with the boat by means of links and tightening levers. The wire rope g g connecting the counterpoises with the apron on each side is double and continuous; it passes half around equalizing sheaves, one at the end of the supporting beam of the apron, and one at the counterpoise. From the top of the boxes containing the counterpoises the chains K pass partly around the sheaves 11, and the sheave m in the crosshead J of the hydraulic lift 0, and are secured at n. From the bottom of the counterpoise the chain K' passes Similarly around l' l' and m', and is secured at n' (Plate LXI). The lift is supplied from the accumulator G, into which fresh water is pumped by hand from the tank R by means of the pump I. It is necessary to have a man at, each slip, and he has sufficient time to attend to pumping, so that power is obtained at no expense. The distribution valve of the lift T, shown in detail (Plate LXI), is so arranged that when the power is cut off the ends of the cylinder are connected, so that the piston may be drawn either way and the apron rise and fall with the tide, the water in the cylinder merely circulating around. When the connterpoise rises or falls it pulls the piston of the lift toward one or the other end of the cylinder by	means of the chain K or K'. The stroke of the piston is sufficient to allow this change of position and leave enough to handle the apron, take up lost motion, and allow clearance, so that, whatever may be the position of the title, the cylinder is always filled with water, and the piston connected and ready to act. There is a lift on each side, but only one accumulator, one tank, and one set of pumps. View Book Image Courtesy History's Imprints. The journal of the hinge H is cylindrical, the axis being at the base of the rail, so that there is no longitudinal motion of the rail. The position of the wharf relatively to the boat is such that the angle between high and low tide is divided by the apron. Besides this, at extreme tides, the angles are filled with steel wedges hinged one at each end of each rail on wharf, apron and boat. These, when not in use, lie to one side of the rail; when it is necessary to use them they are simply turned over on the rail. These wedges are of such dimensions that they divide the angle at extreme tides into three other angles nearly equal, enabling trains to pass without inconvenience. Plate LXII shows more in detail the steering gear and location of engines; referring to tile plan, EE designate the location of the engines and A2, A3 the engine shafts already referred to; P the hydraulic pumps which are arranged in pairs; diameter of water cylinders., 4 inches; steam cylinders, 12 inches, each 12 inches stroke. The discharge from each water cylinder is connected with the accumulator A, which consists of a tank 30 inches diameter by 8 feet in. length, closed on top, kept partially filled with water. The air over the water is kept at a constant pressure by the pumps. In the connection between the accumulator and pressure pipes is placed a weighted valve; this is connected with the engine throttle, and changes the set of the throttle automatically so as to prevent variations of pressure in the hydraulic cylinders. Pressure pipes lead from the accumulator tank to the three way valves located in the hold of the boat under the pilot houses; these valves are shown more fully in detail. It will be thus seen that by moving the valve the pressure may be thrown on either hydraulic piston as may be desired, at the same time changing the exhaust from either cylinder to the tank T, to which the auction pipes from both pump cylinders are connected. The hydraulic cylinders have each a stroke of 14 feet and bore of 5 1/2 inches. There is a pair of hydraulic cylinders connecting with each set of balanced rudders, shown on plan, and more fully shown in detail. The pressure pipes connect with the head of each hydraulic cylinder; the pressure is thrown from one to the other by means of the three-way valve, and the rudders are held in position by closing these valves. As one piston advances the other recedes. The valves are worked, from either pilot house, by valve rods lending valves. The tillers are connected to steering wheels by means of chains and rods running over fair leaders, and to the steering wheels in the usual way. The steering wheels turn with the motion of the tillers the same as though they were used directly. The object of this is that, in case of derangement of hydraulic apparatus, the boat can be steered in the usual way. A peculiar feature of the hydraulic cylinders is that should it become necessary to steer by hand, the piston rods, which are a continuation of rods connecting with the tillers, slide through the pistons, diminishing the power required to turn the steering wheels by the amount of friction necessary to move the pistons and also the water through the pipes, the water being allowed to run from one cylinder to the other through the straight passage in the valve, until the pistons are at the head of the cylinder. By referring to the detail of balanced rudders it will be seen that the four rudders on either end of the boat are connected by coupling rods; the coupling rod connecting the intermediate rudders of the four (it will be seen from end view) is bent upward so as to run close under the fan-tail, and has a hole to receive a pin which holds the rudders in line with the keel. Plate LXII shows the location of the trusses in plan, and the division of the hold of the boat into eleven water-tight compartments by transverse bulkheads; these also add lateral stiffness to the frame. In order to appreciate fully the location where the ferry steamer "Solano" is used, it is necessary to see it; next to that, one should have charts; failing which, I will say that the summer traveler from the East, heated and tired by his six days' ride, is suddenly conscious, when 50 miles from San Francisco, of a delicious coolness, caused by the trade-wind from the Pacific Ocean. At about 30 miles from the terminus there is a stop of a minute, a start followed by a pause of about five minutes, when he feels that in some way his motion has changed, and, going to the car platform, discovers that while he is still on the cars, the entire train is on a boat, which is crossing the Straits of Carquinez. The Straits of Carquinez is a narrowing of what is really an arm of the sea, which, after entering through the narrow "Golden Gate" (so first named by Gen. John O. Fremont), extends in the Bay of San Francisco southerly over 30 miles (extreme width 11 miles) and northerly 12 miles (extreme width 9 miles). It then extends through San Pablo Bay about 13 miles (width 12 miles); thence through the Straits of Carquinez 5 miles, and terminates in Suisun Bay with its area of 11 miles by 6 miles. This (Suisum) bay receives the drainage of the larger portion of the great State of California through its main rivers the San Joaquin and the Sacramento. I may add that, at a low stage of water in the river, the tide is noticeable at Sacramento, nearly 60 miles in a direct line above the Straits of Carquinez, or by the river navigation 125 miles from San Francisco. The width of the Straits is about 1 mile ; the shores are bold ; soundings are over 100 feet ; the current is dependent on the state of the tide, but is said to be at times 8 miles per hour, and every summer afternoon a gale of cold air rushes through this opening in the coast ranges to diffuse itself in the heated interior of the State, which makes life there livable. My remembrance is that the difference in temperature of a summer day between San Francisco and Sacramento is from 30 to 50 degrees. "There is a large tide and a small tide, and file tides are known as high and higher high (or big high and little high), low and lower low ; the lower low occurs after the higher high tide. "The average difference between higher high and lower low water of the same day is 5.2 feet. The greatest observed difference between the two low waters of one day was 5.3 feet, and the greatest difference between the higher high and lower low water of one day was 8.5 feet." My recollection of what I considered the difference in tide is 8.3 feet. This 2004 USGS aerial view (below) of the Carquinez Straits, the six mile long waterway which connects the San Pablo and Suisun Bays, shows the location of the railroad ferry slips built at Benicia (North side) and Port Costa (South side) by the CPRR in 1879, and of the railroad drawbridge between Benicia and Martinez which replaced the ferry when it was opened by the SP on October 15, 1930. 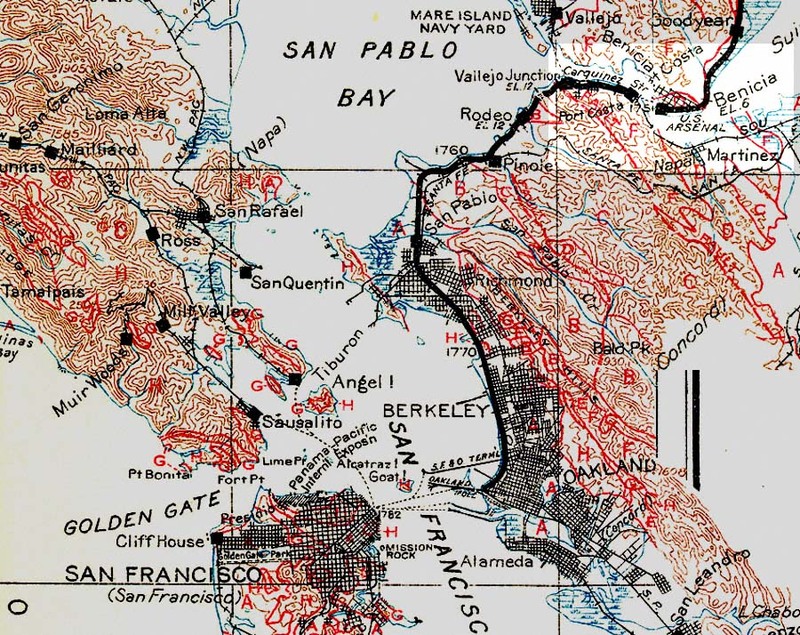 The USGS 1916 map above highlights this location (at the upper right corner of the map), which is also the same location shown by the panorama above. From December, 1879, until the opening of the Benicia-Martinez (Carquinez) Railroad Drawbridge on October 15, 1930, all Central Pacific and Southern Pacific trains crossed the mile-wide Carquinez Straits by ferry between Benicia and Port Costa over the route indicated here. The mouth of the Benicia ferry slip faced downstream (west) and that of the Port Costa slip opened facing upstream (east) of the deep channel tidal straits in which the strong flood and ebb currents run, on average, at from anywhere between one to two plus knots in (west to east) and from two to three plus knots out (east to west) depending on the phase of the moon. 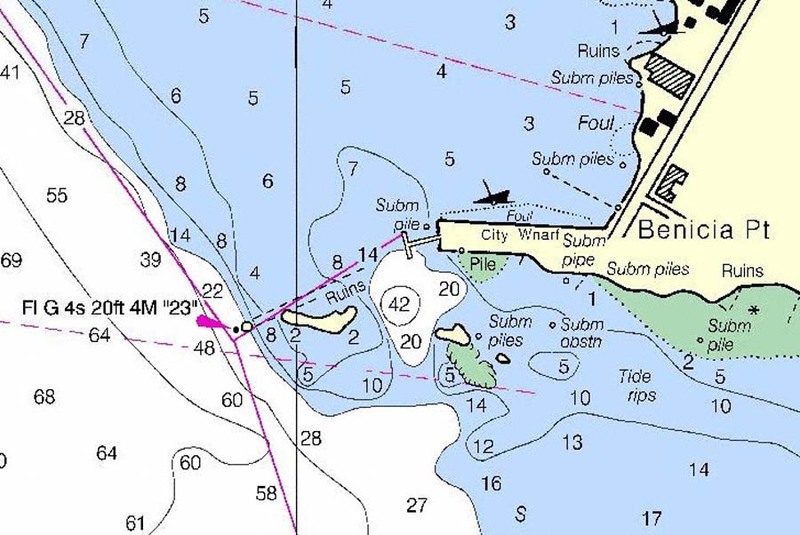 Nautical navigation charts for Benicia and Port Costa show the ruins of the ferry slips and other docks and the depth of the waters around them. The remains of the pier and ferry slip on the Benicia (North) side of the Carquinez Straits. 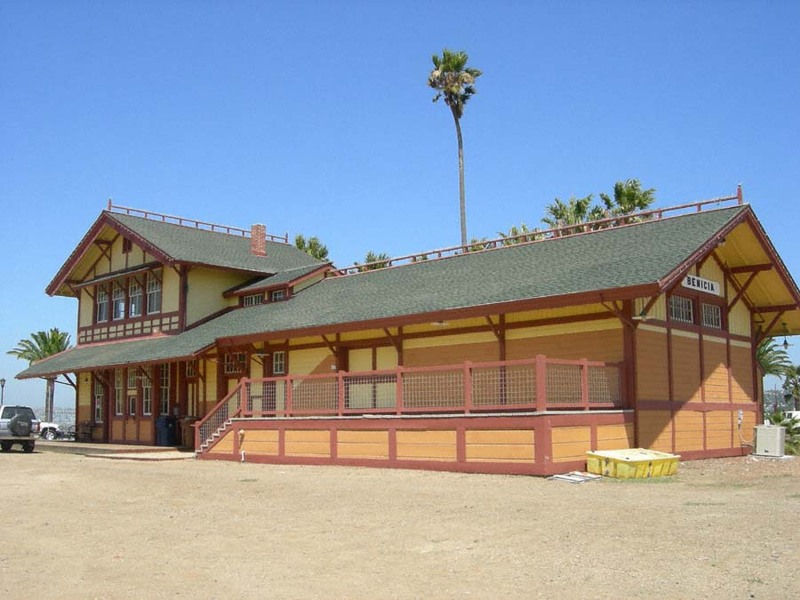 The restored SP depot is located at the base of the pier. 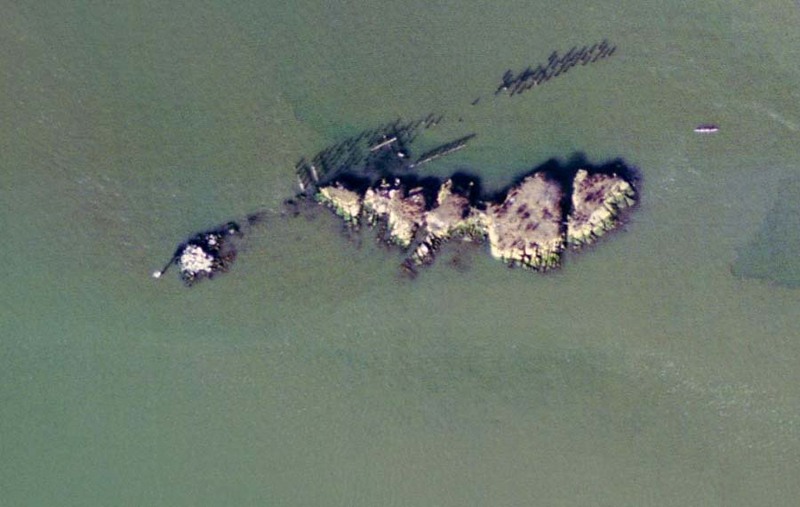 Detail of the remaining wooden piles and rock of the Benicia slip. 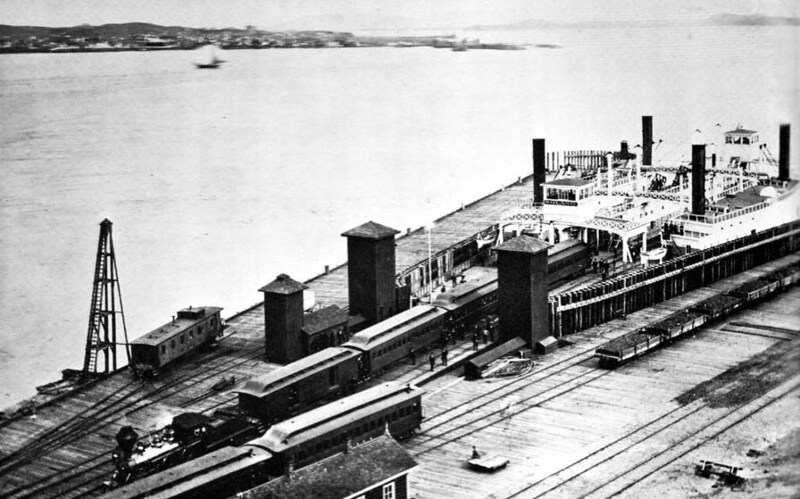 After thirty-five years as the sole means to transporting passenger and freight trains between Benicia and Port Costa, the "Solano" finally got some help in 1914 when the Southern Pacific built and added a second, slightly larger ferry, the "Contra Costa," to the service. 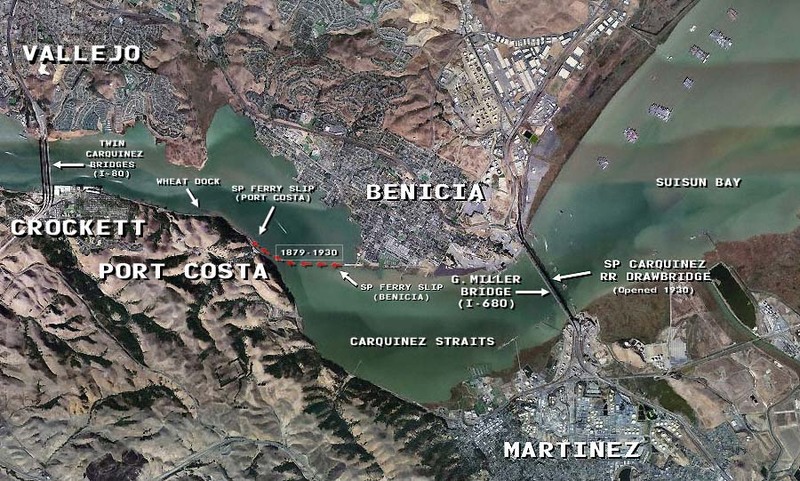 To accommodate the new boat, second slips were also constructed at both the Benicia and Port Costa terminals. The composite image below combines period aerial photographs of the two expanded terminals (with a boat docked in a slip in each one) which have neen digitailly overlaid on an aerial view of the area as it exists today. 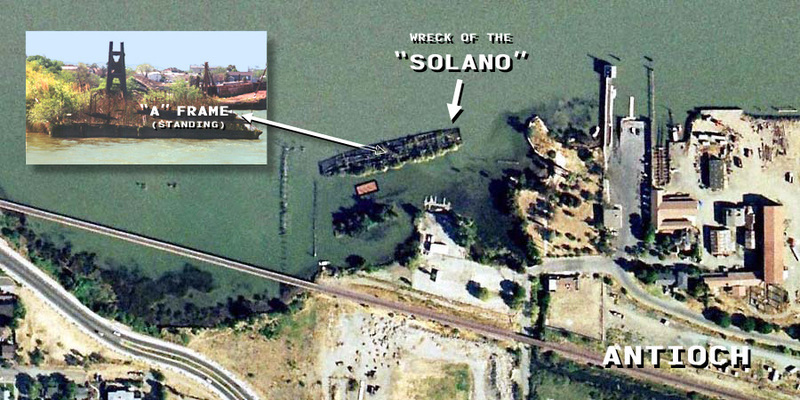 With the end of railroad ferry service on October 15, 1930, the "Solano" was sold by the SP in 1931 and towed some thirty miles east of Benicia to Antioch, CA, where the then half-century old vessel was scuttled to serve as a breakwater. On July 4, 1983, however, a fireworks display on her decks set the wreck on fire and its superstructure burned to the waterline. The A-frames (one still upright) of the engine's walking beams are now about all of the wreck that still appear above the surface of the water to mark the grave of the "Solano." Established in 1879 as the Southern terminus of the CPRR/SPRR train ferry across the Carquinez Straits, Port Costa quickly came into prominence when California businessman George W. McNear, Sr., purchased a large strip of frontage along the shore just West of the ferry slip where he built the immense grain warehouses and docks known as the Port Costa Warehouse and Dock Company. Out of his large holdings McNear laid out the town of Port Costa and also founded other businesses including the Port Costa Water Company. Possessing the deepest channel for accommodating the sailing vessels that traveled the Straits, and offering a short and fast transcontinental railway connection, over the next three decades Port Costa became the West Coast's major grain port shipping wheat and barley from interior California points to all parts of the world. Disastrous fires in 1883,1889, and the early 1900's, however, destroyed many of the town's buildings, and in 1910 the wheat storage warehouse and dock also burned down. 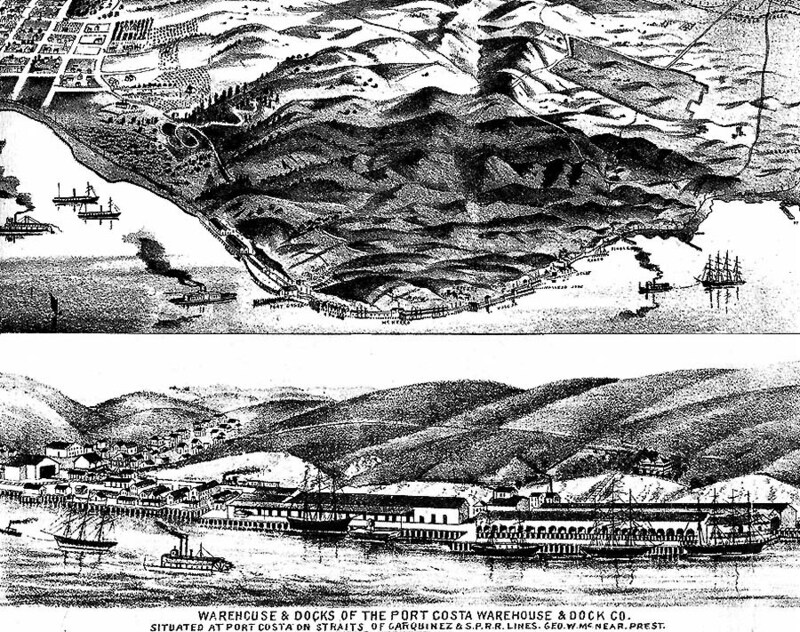 The two engravings below show Port Costa as it appeared in his heydays in the mid 1880's. All that remains of the massive Port Costa Warehouse & Dock Company's massive 1880's wheat and grain warehouses and deep water shipping dock, which connected to the SP tracks just West of the railroad's Port Costa train ferry slip, are the wooden pilings visible in this 2004 USGS aerial image. The SP's depot at Benicia seen here was originally built of redwood in 1879 for the town of Banta, CA, and floated by barge to Benicia in 1902. 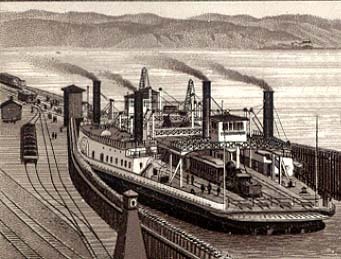 It was located at the base of the SP's ferry slip on the North side of the Carquinez Straits from which trains were then ferried between Benicia to Port Costa just a mile (and a nine minute voyage) away on the largest such boats in the world where they joined the SP's tracks to Oakland. The need for ferry service ended on October 15, 1930, when the SP opened a massive railroad draw bridge across the Carquinez Straits located at the mouth of Suisun Bay between Benicia and Martinez which is still in very heavy daily use today. 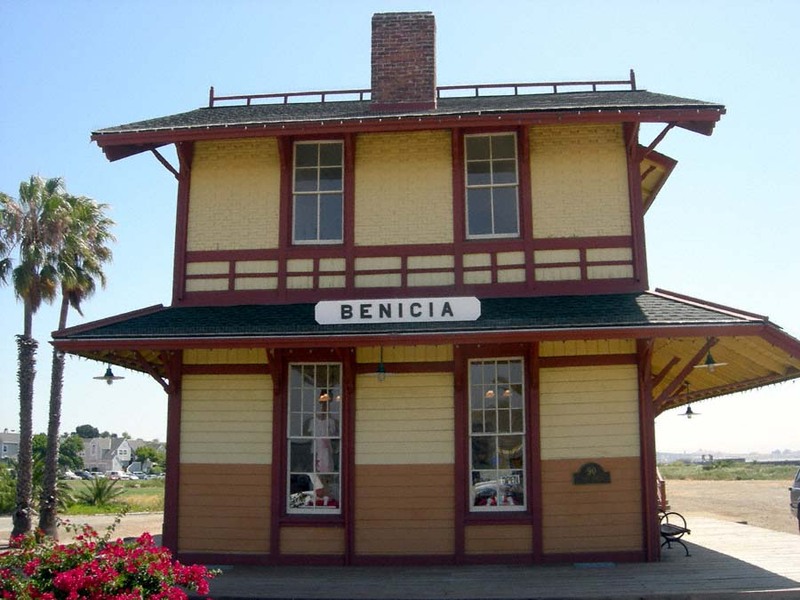 The SP closed the Benicia depot as a railroad business office on August 20, 1958, and the building soon fell into disrepair. In 1987, however, Benicia was selected to participate in the California Main Street Program, a grassroots downtown revitalization program sponsored and coordinated by the State of California Department of Commerce and the National Trust for Historic Preservation. 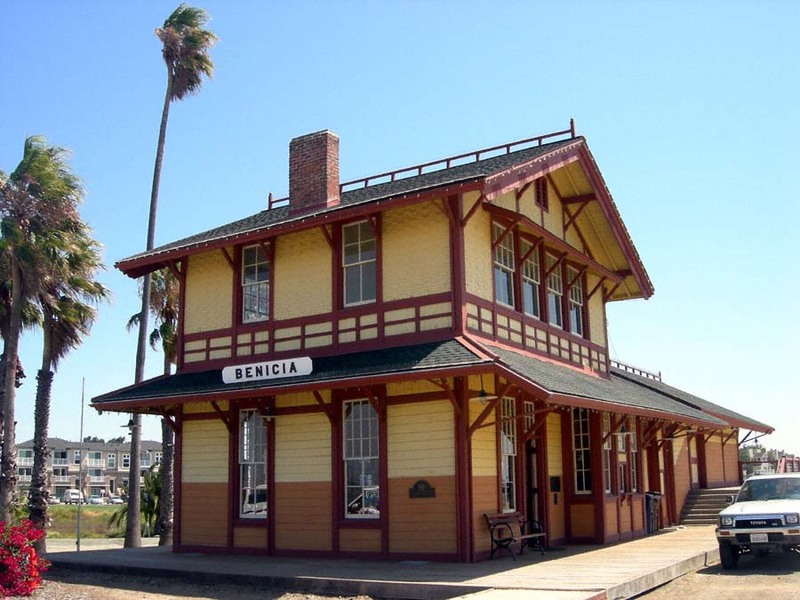 As part of this program, the historic Benicia depot was restored and reopened for public uses in April, 2002. 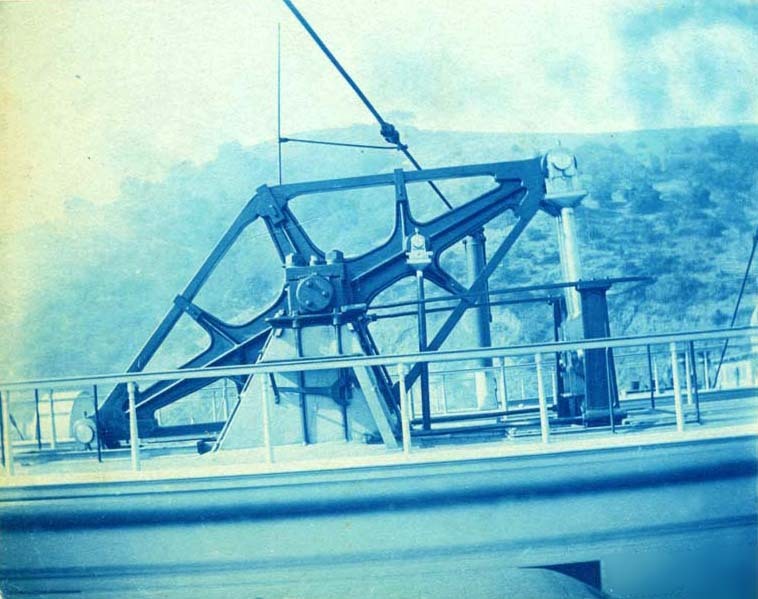 After just over a half century of service, the SP’s train ferry between Benicia and Port Costa ceased operations on October 15, 1930, when the Martinez-Benicia Railroad Drawbridge was opened just a year-and-a-half after the SP began construction on it in May, 1929. At 5,603 feet, this massive span is the longest and heaviest double track railroad bridge west of the Mississippi standing 70 feet above the water at the mouth of Suisun Bay on 10 main and 22 pedestal piers. It is seen here with the draw raised to allow for the passage of the S.S. Jeremiah O’Brien from the Carquinez Straits into Suisun Bay. Based in San Francisco, the Jeremiah O'Brien is one of only two remaining operational WWII "Liberty" ships afloat of the almost incredible 2,751 which were built during the war. Launched at the New England Shipbuilding Co. in South Portland, ME, on June 19, 1943, this class EC2-S-CI vessel was one of the close to 5,000 allied ships and other vessels at Normandy on D-Day. A half century later in June, 1994, the O'Brien had the distinction of being the ONLY ship from that vast D-Day armada to return to Normandy for the 50th Anniversary of that historic event after being sailed there from San Francisco by a volunteer crew of veteran WWII-era sailors. An eastbound Pacific Limited (TR#20) which is just beginning its journey from San Francisco to Chicago is seen boarding the "Solano" at Port Costa in 1917 for the one mile, nine minute crossing to Benicia. The "Solano" arrives at Port Costa carrying a westbound freight train. The city of Benicia and the the SP ferry slip there are visible a mile away on the north side of the Carquinez Straits. A westbound passenger train rolls off the deck of the "Solano" at Port Costa after its brief crossing from Benicia which is visible in the background a mile away across the the Carquinez Straits. The traveler hears but little noise and feels but little jar, for although the engines are powerful the hull is very strong and stiff ; he sees no coal dust nor dirt, for the two or three firemen have but to tend petroleum and steam jets (a California friend who has just arrived corrects me; he says "one or two firemen in handsome business suits and white unsoiled shirts tending taps "). This mode of heating has proved so successful on the "Solano" that it is being introduced on the railroad ferry boats between the terminus at Oakland and the City of San Francisco, which ferriage is about 4 miles. Before the traveler comprehends the neatness or has time to question the economy of the fuel, before he appreciates the boat or fully enjoys the scenery, he finds himself again rushed by the locomotive over the steel rails. I passed back and forth at this ferry several times; at each time the perfection of its operation challenged admiration. A passenger train of, say, ten cars comes to the slip. 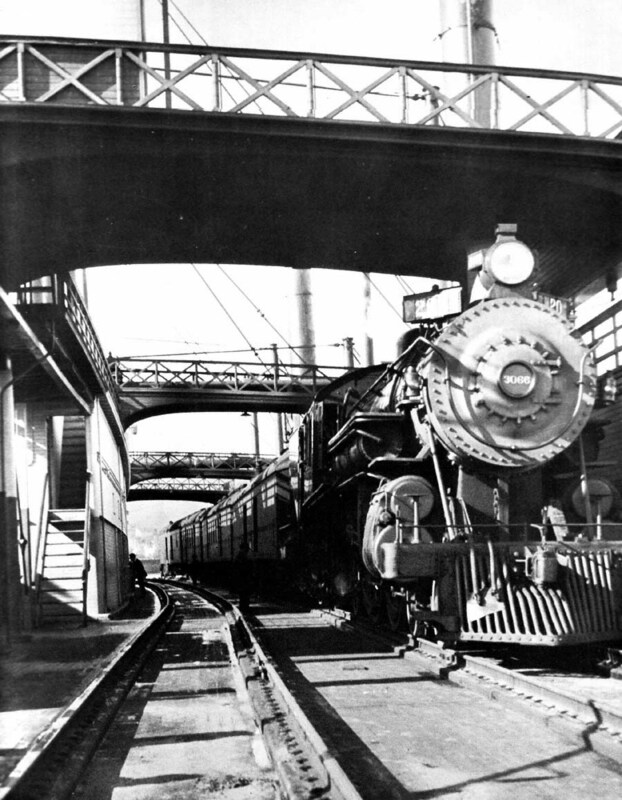 During its pause of a minute, the train has been uncoupled in the middle and a switching engine has been attached to its rear ; the regular engine proceeds with the forward half of the train on to the boat, the switching engine pushes the rear half on another track of the boat, the steamer is cast off with the entire train and both engines as cargo, and yet only two of the four tracks are occupied, for the capacity of the "Solano" is twenty-four passenger cars or forty-eight freight cars with locomotive. The landing of the train is as simple as its embarkation, and is made in the same manner. The total detention of a passenger train at both sides of the Straits, by reason of the ferry, seldom amounts to fifteen minutes; the time card shows for the station of Benicia on the north and Port Costa on the south of the Straits, twenty-five minutes total difference, including embarkation, ferriage, landing and station stops. This ferriage forms a most pleasant interlude on the long journey, equaling the stop at Multnomah Falls on the route of the Northern Pacific Railway at about the same distance from its Portland station, and to a traveler is no more of an objection to the route. It is a delay of fifteen minutes in a journey of 10 000 minutes, which, were it necessary, could be shortened some 3 000 minutes, and yet the trains not be run on what is called "fast time." Neither a tunnel nor a bridge in this vicinity can be seriously considered for the present, while to remain on the south side of this water is to use part of the route first built by the Central Pacific people, the "Western Pacific Railroad," to a junction at Sacramento with an increased distance of 60 miles, or double the distance by the short "California Pacific," now the main passenger route, our old opposition road, to which feature of directness I recur with pleasure as once its chief engineer. There is no gainsaying the old axiom, "A straight line is the shortest distance between two points," especially if by traveling it all grades are avoided. The following additional information in regard to the Solano has been obtained by reason of the interest manifested at the presentation of the foregoing paper. The idea of this large ferry-boat was suggested by Governor Leland Stanford, President of the Central Pacific Railroad Company, and now United States Senator from California. 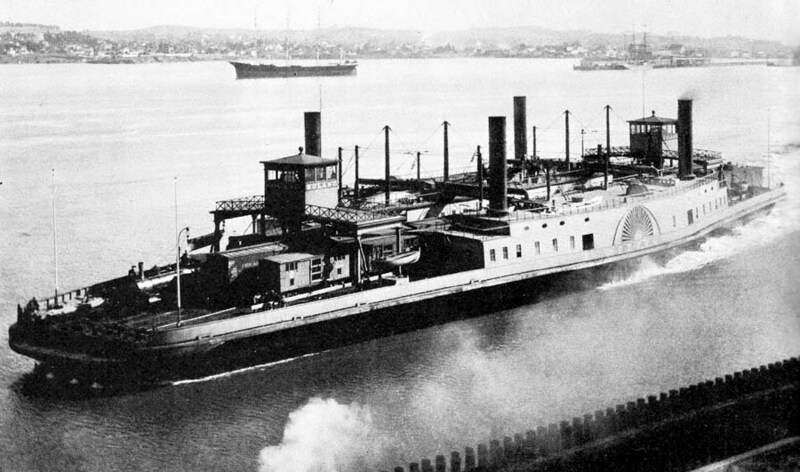 The design and construction of the "Solano" were entrusted to Mr. Arthur Brown, West Oakland, Cal., Superintendent of the Bridge and Building Department of the Railroad Company, with the only conditions that she should be large enough to convey one of the largest freight trains across the Straits of Carquinez. The boat generally, the slips, approaches, aprons, machinery, and all other accessories, were designed and built by Mr. Arthur Brown. The engines were designed and built by the Harlan & Hollingsworth Company, Wilmington, Del. The boilers were designed and built, and the machinery in the boat was erected, by Mr. Andrew J. Stevens, Sacramento, Cal., the Master of Machinery for the railroad company. The boat is considered a success in every particular. The hull is of wood; the longest timbers are the deck beams, which are single sticks 115 feet in length. There were a great many sticks of large size up to 100 feet long. The trusses under the tracks take the place of keelsons, so that excessively long sticks were not a necessity for that duty. There have been no measurements of the actual evaporation accomplished with either coal or oil. As the duty performed by coal and oil is the same, a comparative idea of their efficiency may be obtained from the foregoing data. According to the calculations of those using the boat, the saving by the use of fuel oil is about 18 per cent., principally in labor. A diagram of the mode of using oil has been received. The total detentions, including stoppages at both ends of the trip, are about ten minutes. "The use of petroleum, as a fuel for making steam on our boats, was discontinued because it was found that, as the boilers were not constructed for such fuel, its further use might result in injury to them. It would seem that for liquid fuel, boilers should be of special construction." Harris, Robert L., "The Railroad Ferry Steamer 'Solano. '," American Society of Civil Engineers. Transactions, vol. 22, No. 436, 1890, New York, ASCE, 1890, pp. 247-261. American, Port Costa, California, Solano 1879-80? 14 1/2 x 21 in. The camera angle from Carleton Watkins's position atop a hillside produced a dynamic image with extreme diagonals and numerous triangles. Watkins took this picture at Port Costa off the Carquinez Straights, where the transcontinental trains were ferried across the waters on the newly built Central Pacific train ferry Solano, "the largest train ferry in the World" between Port Costa and Benicia, California, on their final leg to San Francisco. The smoke is billowing forth from a train about to depart from the Port Costa station westbound to Oakland/San Francisco. The position of the eastbound train on the ferry suggest that the ferry and train are about to depart for Benicia. 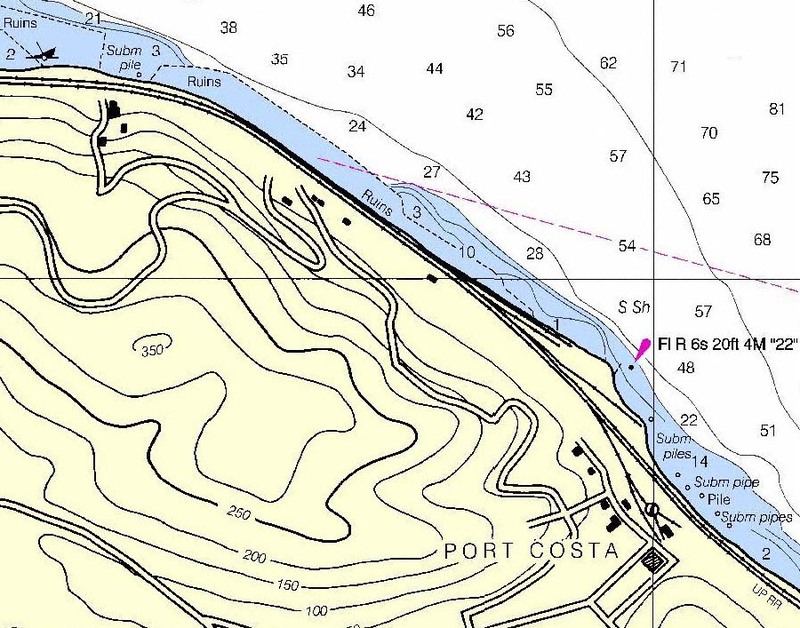 Thomas Rubarth notes regarding the wharf at Port Costa that the pilings used to support the wharf are approximately 18" - 20" in diameter spaced at 10 ft intervals parallel to the shore and 7.5 ft intervals perpendicular to the shore. The top wooden beams that were placed immediately across the top of a row of wood pilings appear to be 18" or 20" square. 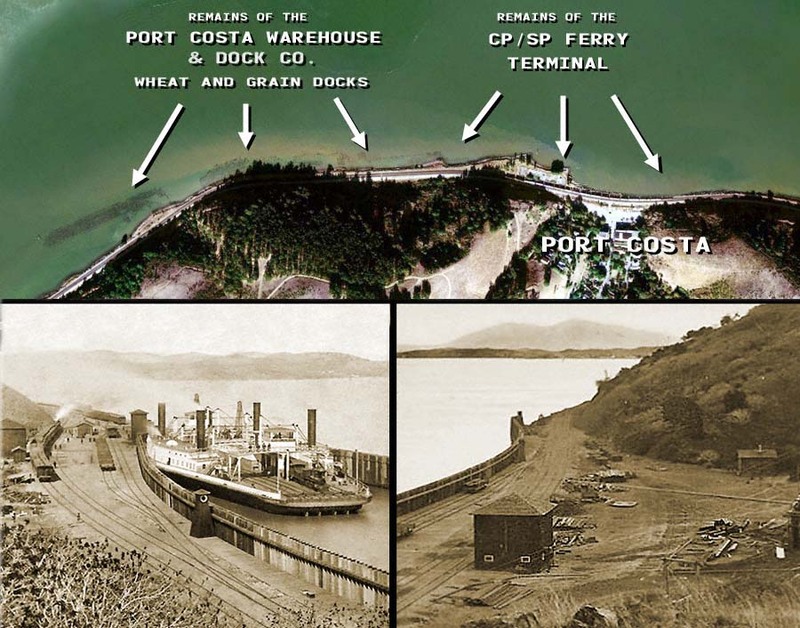 The dock was modified somewhere around 1915 or 1916 to accommodate the Contra Costa, but we do not have any documentation of construction changes. This Central Pacific/Southern Pacific Solano ferry plan package contains all the plans we were able to dig up after 20 years of research. Note that the Solano went through many changes during her 51 years of service and that, if you are considering building a model of the later ferry, many of these changes are not apparent unless one carefully studies multitudes of photographs of her (Try the Union Pacific/Southern Pacific archives in Council Bluffs, IA, the California State Railroad Museum, and the San Francisco Maritime Museum National Park for photo sources). What we realized (after much confusion early on in our observations) was that, in addition to obvious cabin changes, other changes were discovered that were not obvious at all. For instance, Solano’s original rudder configurations were modified, 500 feet of cabin walls suddenly get moved 3 feet, hogging posts and masts move and get beefier, her front “bumper” areas get reinforced, and even Solano’s four stacks change location …as she is modified through the years to take on larger and heavier railroad equipment. So consider checking these plans very carefully against photos of the era you plan to model. We hope you enjoy these plans. 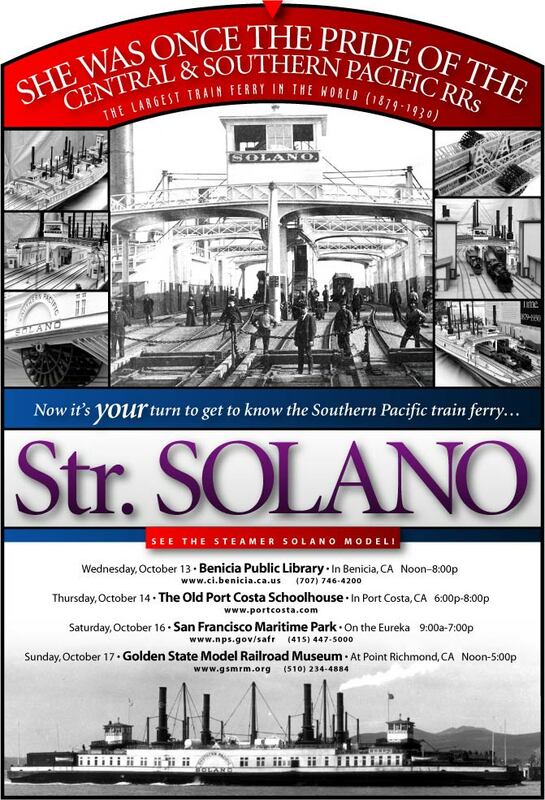 The Solano was a great engineering feat for her designer and builder, the Central Pacific Railroad! And the Solano served the SPRR Transcontinental route faithfully for over half a century! We have made this collection of plans available to all in hopes of keeping the memory of this great vessel alive. Additional articles from International Marine Engineering, 1914 and 1915. "Central Pacific and Leased Railroads Locomotives, Cars, Steamers and Barges." 1878.